"Whenever I make this roast for company they always ask for the recipe. 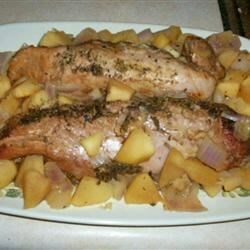 I have also made this with a pork tenderloin and it comes out great!" In a small bowl, combine the sage, thyme, rosemary, marjoram, salt and pepper. Rub over roast. Cover, and refrigerate roast for 6 to 8 hours, or overnight. Place roast in a shallow roasting pan, and bake in the preheated oven for 1 to 1 1/2 hours. Drain fat. In a medium bowl, mix apples and onion with brown sugar. Spoon around roast, and continue to cook for 1 hour more, or until the internal temperature of the roast is 145 degrees F (63 degrees C). Transfer the roast, apples and onion to a serving platter, and keep warm. To make the gravy, skim excess fat from meat juices. Pour drippings into a medium heavy skillet. Stir in apple juice and syrup. Cook and stir over medium-high heat until liquid has been reduced by half, about 1 cup. Slice the roast, and serve with gravy.